A belated Happy New Year to our friends, family, and loyal readers, old and new, from Mitch and Val in SoCal! We’ve been quietly enjoying the region of Palm Springs, California, since October, and plan to stay a while. Most of our activity has been on our facebook page. But I haven’t forgotten about my blog, and I don’t intend to stop writing about all those adventures, even if it’s weeks or months after the fact. We’ve had a lot going on, had a wonderful holiday with lots of friends and family, and I’ve been too preoccupied to blog. But we have too many pictures and adventures *not* to write about them! It’s long overdue, but finally, here’s our YouTube channel brand video debut for RVLuckyOrWhat. Thanks to Mitch’s son Greg for putting it together as a project in his film class at the University of Utah!!! We LOVE it!!! It’s a gift we’ll always cherish! What a great way to sum up our almost 2.5 years of full-time RV adventures on the road. One of the best things about this life roaming the US in an RV is visiting friends and family around the country. All the new people Mitch and I meet are a huge bonus. What’s hard about this life, however, is that you miss a sense of community. You miss your friends from home, you miss going to their events and seeing your neighbors around, and seeing people you know when you’re out. So it means so much when you meet someone with so much in common, and then you come to find out you’ll be in the same place again down the road. So it was with Marc and Julie Bennett of RV Love. Ah, the beauty of the interwebs! We “met” Marc and Julie Bennett of RV Love through Instagram, the social media app that lets you share inspiring pictures. Then, on a walk around the Garden of the Gods RV Park in Colorado Springs one June evening, Mitch and I noticed their Allegro bus rig and little MINI Cooper convertible displaying their logo, “Live. Love. Travel. RV Love.” And I immediately recognized their brand. I looked them up, sent them a message and we met for social hour around their campfire. Whereas most full-time RVers are retired, Marc and Julie are full-time RVers who are working age, like us. Marc grew up in Colorado, while Julie grew up in Sydney, Australia. Also like us, they sold their sticks & bricks home to expand their horizons and see the USA in a motorhome. Marc works full-time as Operations Manager for a nutritional supplement company, and Julie is a lifestyle coach. In the sharing of their journey via their blog and social media platforms, they’ve become a social media sensation with a following of thousands and over half a million views on their YouTube channel! We had a lot of fun hanging out with the Bennetts during our time in Colorado Springs. We were all scheduled to be at Cherry Creek State Park in Aurora, Colorado, at the same time about a week later, so we made plans to meet them again down the road. We went to TAG restaurant in Denver with them to celebrate their two-year “nomadiversary” – just a few weeks before ours! Julie and I bonded easily like two long-lost girlfriends, even though she looks like she could be my much-younger daughter. I’m a jolly giant at 5’10” and she’s a spritely elf at 4’8”! And we had a laugh when we found out that I went to high school in Sparks, Nevada, with Marc’s boss, Bert Wegner! I have stories about parties at Bert’s house back in the day. What’s even funnier is that Bert is my Friend on Facebook; Bert noticed the picture of the four of us together (Marc, Julie, Mitch and I) and he did a double take because he thought Marc was Mitch. A few people have commented on the resemblance of Marc and Mitch – they could be brothers! Garden of the Gods Visitor Center has a view of the red rocks that the park is known for, and Pike’s Peak in the background. Mitch and I have been so busy with work and exploring new places that I haven’t blogged in over two months – I hope you can forgive me, dear reader. I have at least been posting frequently to my accounts on Instagram and Facebook, so if you’re ever wondering what we’re up to, please check out the action there. This week finds us in Page, Arizona, at beautiful Lake Powell! It’s great to have been in Utah’s red-rock country for the past six weeks. While in Bryce Canyon, Utah, two weeks ago, we celebrated our two-year “nomadiversary!” It’s hard to believe we are now in our third year of living, traveling, and working from our RV full-time! Our travel post this week comes to you from our visit to Colorado Springs in June. Mitch and I spent six weeks in Colorado from early June through mid-July. We left loving the state even more than we already did. 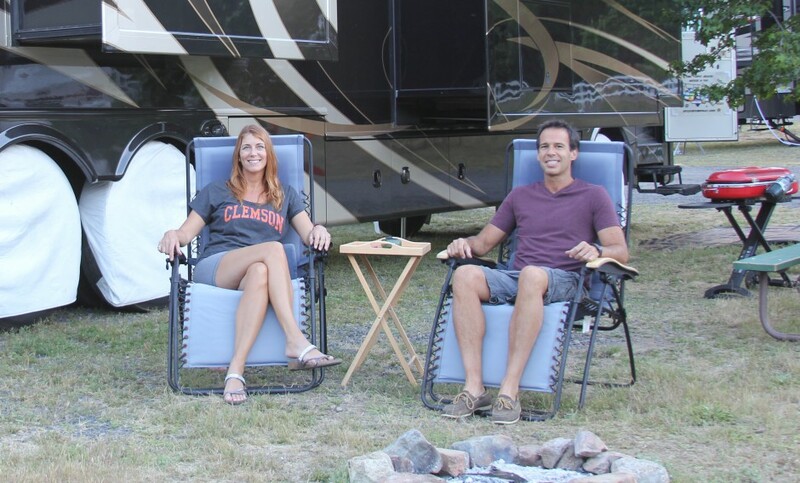 Before our full-time RV adventure started in 2012, we had both spent time in Colorado – Mitch on vacations, skiing and RVing with his kids, and Valerie having lived in Grand Junction, Colorado, for six years in elementary and junior high school. But neither of us had ever spent much time in the city of Colorado Springs – our loss entirely. Garden of the Gods RV Resort sounds nice, right? Well, the RV park is not as impressive as its name. Although the website claims “spectacular views of Pike’s Peak,” we noticed that the trees pretty much obscure the view throughout the campground. It wasn’t even worth a picture of the RV in its site. But the location near the mountainous west side of Colorado Springs (near the town of Manitou Springs) was perfect for exploring numerous sights. In fact, CO Springs had *so* much to do and see, that our ten days there were barely enough. Each of the following “Things To Do” are “Must-Sees” in and around CO Springs. Each deserves its own blog post. But as time, metered data, and cellular connection are limited, I’ll stick to just the top few. Cholla cactus and the glowing sky at sunset in Anza-Borrego State Park near Jacumba, CA. After spending the spring of 2016 RVing through the desert southwest, is it any surprise that I took at least 100 pictures of cactus? Doesn’t everyone take pictures of cactus? Maybe not, but perhaps it seems less nutty in light of the fact that Mitch and I were in several gorgeous state parks and national parks where cactus was in full bloom. So with apologies to Sheldon Cooper (you know, the nerd on Big Bang Theory who does a “Fun With Flags” video series), allow me to present some amazing, informative and amusing facts about southwest cacti for the cause of cacti awareness. I bring you, Fun With Cactus. I am by no means a cactus expert, I’m just an amateur nature enthusiast and a science writer. So I do know how to research things. And compared to Mitch, I’m a flora and fauna expert. So I’m just gonna go for it, but don’t quote me. And if you identify any mis-identifications, let me know! We have not been posting as much to our blog as we’d like in 2016. I’ve only managed to write a blog post about once a month. Sorry! We’ve been so very busy! Let us fill you in! Since I last posted about our travels, we’ve explored the entire southern border of the US with Mexico. We left from San Diego in mid-March, and have now gone all the way to South Padre Island at the tip of Texas! Along the way we stopped in the Yuma area (near the border of AZ and CA) for a few days, where we visited with our friends Roger and Gail and I got the RV stuck in deep sand. (Yeah, I’m gonna cruise right past that embarrassing story and save it for another day.) Then we walked over the Mexican border at Los Algodones, a popular destination for retirees and RVers to get state-of-the art but inexpensive pharmaceuticals, eyeglasses, and dental check-ups! We saved a lot of money and enjoyed some margaritas in the sunshine while we were there. We stayed in Tucson for two weeks, visiting our friends Keith and Nicole Davis and seeing everything we missed last year, including Old Tucson Studios, Tombstone, and Bisbee. We saw Val’s cousins in Las Cruces, NM, and hiked nearby Dripping Springs Natural Area. All of this repeating of previous destinations from last year was mostly just to get to Big Bend National Park in the southwestern elbow of Texas – one of the biggest national parks left on our list to visit in the RV, and one of the hardest to get to! With over 800,000 acres of protected area, Big Bend is BIG, but only a fraction the size of Death Valley National Park in CA with its 3.4 million acres. The scenic Chisos Mountains are entirely contained in Big Bend National Park. My expectations of our first long-awaited visit to Big Bend National Park included sweeping mountain vistas and hiking adventures. I also expected April in Big Bend to involve flowering cactus and extreme heat countered with cool views of the Rio Grande (the river that defines the border between Texas and Mexico). We were not disappointed. What I didn’t expect was how many amazing deep canyons it holds. Nor did I understand that Big Bend is an animal bonanza in the middle of the one of the most remote spots in the U.S.
Motorcoaches Versus Fifth Wheels: Which RV to Choose? Motorhomes Versus Fifth Wheels: What’s Behind the Choice? Why do some people choose motorcoaches and some choose fifth wheels? What Type of RV Should You Choose? Love camping and travel? Dreaming about buying a recreational vehicle (RV)? When it comes to shopping for an RV, the choices can be overwhelming. Where do you start? The answer depends on numerous factors with a tangle of pros and cons, and is quite different for everyone. When you start your search, you’ll need to understand the different classes of RVs. Each type has its pluses and minuses.